For a long time it seemed unlikely that a new Spelunky speedrun record would ever be set. Speedrunner Spelunky God managed to complete a regular playthrough (ie, not a hell run) in 1:41.499 last year, thanks to what has become a mandatory Spelunky speedrunning tool: the warp device. But whereas Spelunky God only acquired the device in the second level of his playthrough, the new record holder D Tea was lucky enough to get it almost immediately. "In the end luck gets me further than skill," the speedrunner writes in the video's description, which shows the new 1:40.145 run in its entirety. That's only a fraction less than a second compared with the previous record holder, but it's still an impressive feat. Of course, these runs only visit the (relatively easy) main worlds: there are players dedicated to speedrunning Spelunky's notoriously difficult Hell run too, with the record currently sitting at a smidgeon under four minutes. 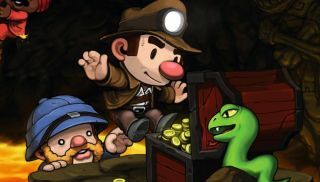 In other Spelunky news, creator Derek Yu has written a book about the game, which releases this month. Look out for an interview with Yu in the coming weeks.